The first complete book outlying the history, structure, weapons and uniforms of one of the Twentieth century’s most formidable organisations. If you want to understand the workings of the IRA this is the book. It contains many rare and unpublished photographs, including two taken inside the GPO on Easter Thursday 1916. 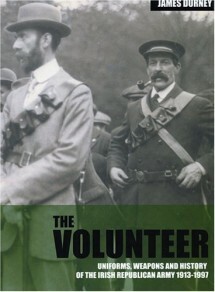 88 pages, 70 photos, many archival and personal; eight pages of artwork depicting uniformed volunteers in various campaigns. Available at all good bookshops or to purchase online from this site.